Flanders Marine Institute (2018). Maritime Boundaries Geodatabase, version 10. Available online at http://www.marineregions.org/. 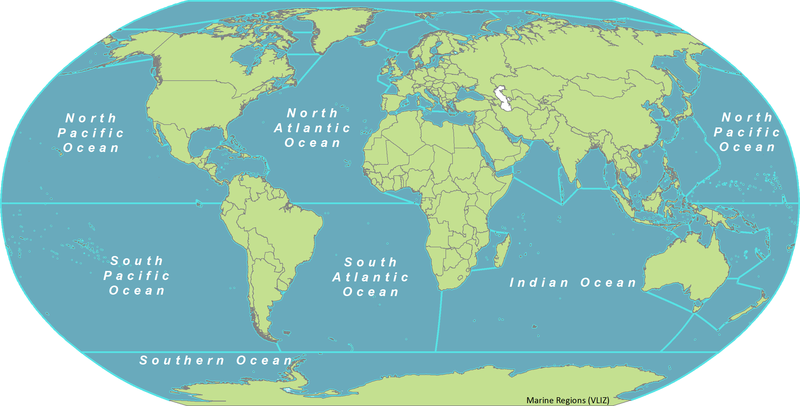 Please note that the EEZ shapefile also includes the internal waters of each country. Remarks and corrections can be sent to info@marineregions.org. This dataset builds on previous versions of the world's EEZ. In version 9, the 200 nautical miles outer limit was completely recalculated using a higher resolution coastline as a normal baseline (ESRI Countries 2014) and straight baselines, where available. This dataset consists of two shapefiles: polylines that represent the maritime boundaries of the world's countries, the other one is a polygon layer representing the Exclusive Economic Zone of countries. This dataset also contains digital information about treaties, joint regime, and disputed boundaries. Flanders Marine Institute (2018). 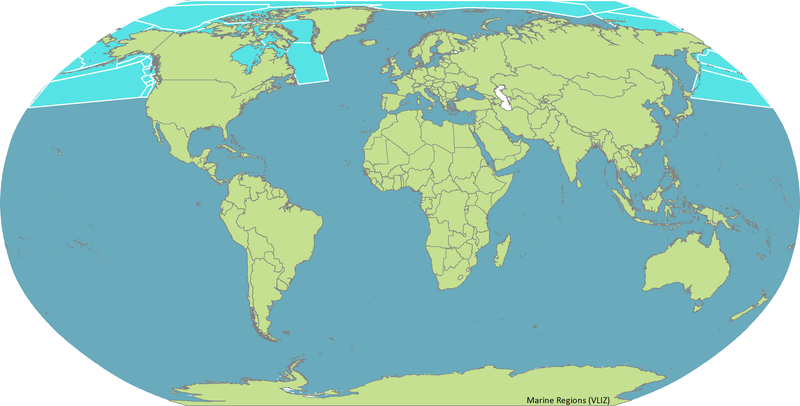 Maritime Boundaries Geodatabase: Maritime Boundaries and Exclusive Economic Zones (200NM), version 10. Available online at http://www.marineregions.org/ https://doi.org/10.14284/312. Area enclosed within the maritime delimitations of a coastal state extending 12 Nautical Miles seawards from the baselines (normal and straight where available). Flanders Marine Institute (2018). Maritime Boundaries Geodatabase: Territorial Seas (12NM), version 2. Available online at http://www.marineregions.org/ https://doi.org/10.14284/313. 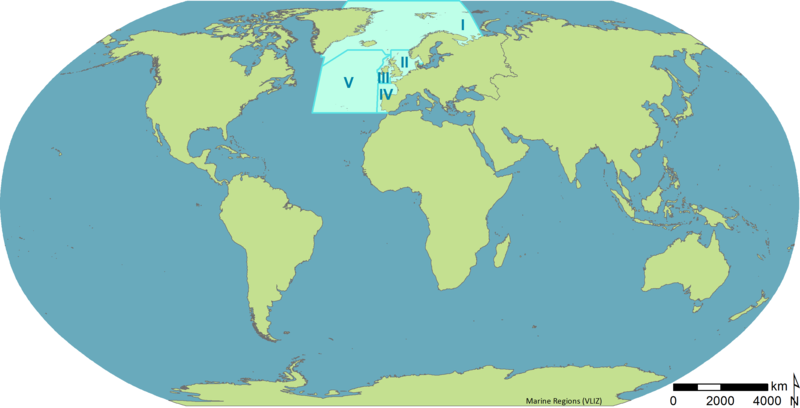 Area enclosed within the maritime delimitations of a coastal state extending 24 Nautical Miles seawards from the baselines (normal and straight where available) and excluding the 12 nautical miles zone. Flanders Marine Institute (2018). Maritime Boundaries Geodatabase: Contiguous Zones (24NM), version 2. Available online at http://www.marineregions.org/ https://doi.org/10.14284/314. The area of the seas enclosed between the landward side of the Straight baselines and the seaward side of the normal baselines (coastline). Flanders Marine Institute (2018). Maritime Boundaries Geodatabase: Internal Waters, version 2. Available online at http://www.marineregions.org/ https://doi.org/10.14284/315. The area of the seas enclosed between the landward side of the Archipelagic baselines and the seaward side of the normal baselines (coastline). Flanders Marine Institute (2018). Maritime Boundaries Geodatabase: Archipelagic Waters, version 2. Available online at http://www.marineregions.org/ https://doi.org/10.14284/316. Flanders Marine Institute (2016). Maritime Boundaries Geodatabase, version 1. Available online at http://www.marineregions.org/. 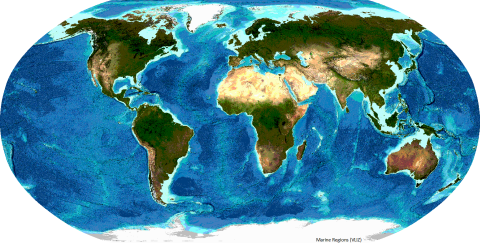 This dataset represents the boundaries of the major oceans and seas of the world. The source for the boundaries is the publication 'Limits of Oceans & Seas, Special Publication No. 23' published by the IHO in 1953. The dataset was composed by the Flanders Marine Data and Information Centre. NB: The Southern Ocean is not included in the IHO publication and its limits are subject of discussion among the scientific community. The Flanders Marine Institute acknowledges the controversy around this subject but decided to include the Southern Ocean in the dataset as this term is often used by scientists working in this area. For more information, please refer to the Disclaimer. Flanders Marine Institute (2018). IHO Sea Areas, version 3. Available online at http://www.marineregions.org/. https://doi.org/10.14284/323. Flanders Marine Institute (2017). IHO Sea Areas, version 2. Available online at http://www.marineregions.org/. The maritime boundaries provide a useful tool to limit national marine areas, but do not include information on marine regional and sub regional seas. This hampers the usage of these boundaries for implementing nature conservation strategies or analyzing marine biogeographic patterns. 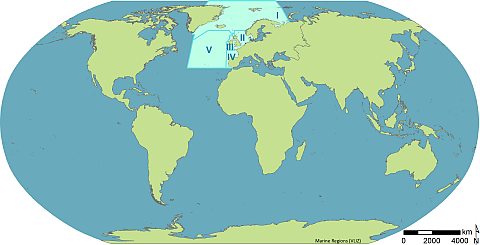 For example, a species occurring in the German EEZ can live in the North Sea, the Baltic Sea or Kattegat area. Each of these different marine areas has very distinct hydrological, oceanographic and ecological conditions. Therefore, by combining the information on regional seas and national maritime boundaries, we can include both a environmental and managerial factor. We propose to overlay the information from the maritime boundaries (the Exclusive Economic Zones) with the IHO Sea Areas (IHO, 1953). This map including the global oceans and seas, has been drafted for hydrographic purposes, but also gives an unequivocal and acceptable distinction of the regional seas and oceans from an oceanographic point of view. The combination of these two boundaries allows us for example to create national regional sea areas for the global ocean. We digitized the IHO Sea Areas using the publication 'Limits of oceans and seas (IHO, 1953). 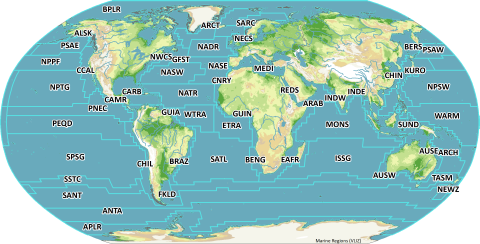 The dataset, available as ArcGIS Shapefile (polygons), represents the boundaries of the major oceans and seas of the world. For the maritime boundaries, we worked with the MarBound-layer version 1 or 2, with the low resolution coastline, that matches the ESRI Country shapefiles but implemented the change history file of the latest version. Since the third version onwards, the Marbound polygon layer has a high resolution coastline (GSHHS), which has advantages, but on the other end, the size of the file makes it difficult to handle for calculating the intersections. In addition, using two shapefiles with a different resolution creates a lot of small polygons that should have been checked to decide to which Marine Area it belonged. This would have been a very time-consuming task and the result would have been an enormous file, difficult to work with within an acceptable period of time. We used the software ArcMAP 9.3 to make the new national sea boundaries intersect was, with several additional tools. The Analysis Tools Intersect to, Graphics and shapes, Calculate Geometry to, Field Calculator (ArcGIS), used to define the names and ID's using Visual Basic Expressions and the ET GeoWizards to remove multiple fields in the attribute table, to perform an Erase, Merge Layers. If one uses the intersect method and both shapefiles are not exactly the same, in this case for instance for the coastline, we would create again lots of small polygons to analyze one by one. Although we did our best to minimize this, by using a lower coastline resolution, the small parts still appeared. If one uses the Intersect Tool, the result contains only the overlapping parts of both shapefiles. In the output of the Intersect Tool, only the EEZ features remain (Figure 6), but we also need the open sea oceans. Therefore the ET Geowizards Erase Tools was used, to delete from a rectangle all land and EEZ areas, so only the 'open seas' remained. This layer, with the result of the intersect were merged (Figure 8). Areas with the same Exclusive Economic Zone and the same sea basin were merged (with the Editor in ArcMap, except when both features are not connected to each other (single part features). The last step was calculating the surfaces of each Marine Area. Different coordinate systems exist to perform geometric calculations, some are more precise then others, we opt for the method proposed by Jenness Enterprises to calculate surfaces on a sphere. Creation of names for the Marine Areas. As example, the ones for the Italian EEZ have been chosen. The result of all this is a shapefile with 525 features. Flanders Marine Institute (2012). Intersect of IHO Sea Areas and Exclusive Economic Zones (version 2). Available online at http://www.marineregions.org/. Flanders Marine Institute (2010). Intersect of IHO Sea Areas and Exclusive Economic Zones (version 1). Available online at http://www.marineregions.org/. This dataset combines the boundaries of the world countries and the Exclusive Economic Zones of the world. It was created by combining the ESRI world country database and the EEZ V7 dataset. Flanders Marine Institute (2014). Union of the ESRI Country shapefile and the Exclusive Economic Zones (version 2). Available online at http://www.marineregions.org/. Consulted on 2019-04-18. The data set consists of a polygon file defining the limits of water bodies from the SeaVoX Salt and Fresh Water Body Gazetteer. SeaVoX is a combined SeaDataNet and MarineXML vocabulary content governance group, it is moderated by BODC. This polygon data set defines the geographic extent of the terms specified by the SeaVoX vocabulary governance to describe coherent regions of the hydrosphere. It includes land masses enclosing freshwater bodies. The coastline data set used in the shapefile is taken from the World Vector Shoreline data set (scale 1:250,000). Reference for the data set: Polygon data set of the extent of water bodies from the SeaVoX Salt and Fresh Water Body Gazetteer, http://vocab.nerc.ac.uk/collection/C19/current/. The data file follows a hierarchical structure with each region consisting of one or more polygons. This approach was adopted to avoid the need to have overlapping polygons in regions where a sea area included a number of sub-regions, for example the Mediterranean Sea includes the Aegean Sea, Ionian Sea etc. The following gives the level in the structure at which particular regions, which consist of more than one polygon can be found. This level in the structure is given by the polygon's attributes. The SeaVoX Salt and Fresh Water Body Gazetteer. Available online at http://www.marineregions.org/. Consulted on 2019-04-18. A shapefile containing the external boundary and internal region boundary lines to describe the OSPAR area and a shapefile to describe the OSPAR Regions. Depth and topography directly and indirectly influence most ocean environmental conditions, including light penetration and photosynthesis, sedimentation, current movements and stratification, and thus temperature and oxygen gradients. These parameters are thus likely to influence species distribution patterns and productivity in the oceans. They may be considered the foundation for any standardised classification of ocean ecosystems, and important correlates of metrics of biodiversity (e.g. species richness and composition, fisheries). While statistics on ocean depth and topography are often quoted, how they were derived is rarely cited, and unless calculated using the same spatial resolution the resulting statistics will not be strictly comparable. We provide such statistics using the best available resolution (1-minute) global bathymetry, and open source digital maps of the world's seas and oceans and countries' Exclusive Economic Zones, using a standardised methodology. We created a terrain map and calculated sea surface and seabed area, volume, and mean, standard deviation, maximum and minimum, of both depth and slope. The surface area, and the seabed area, volume, depth, slope, and topographic variation for the world's seas, oceans and countries. Available online at http://www.marineregions.org/. Consulted on 2019-04-18. LMEs are natural regions of ocean space encompassing coastal waters from river basins and estuaries to the seaward boundary of continental shelves and the outer margins of coastal currents. They are relatively large regions of 200,000 km2 or greater, the natural boundaries of which are based on four ecological criteria: bathymetry, hydrography, productivity, and trophically related populations. The theory, measurement, and modeling relevant to monitoring the changing states of LMEs are imbedded in reports on ecosystems with multiple steady states, and on the pattern formation and spatial diffusion within ecosystems. The concept that critical processes controlling the structure and function of biological communities can best be addressed on a regional basis has been applied to the ocean by using LMEs as the distinct units for marine resources assessment, monitoring, and management. Credit: Large Marine Ecosystem Program NOAA-Fisheries Narragansett Laboratory Narragansett, R.I. 02882 (lme.edc.uri.edu). The dataset represents the division of the world oceans into provinces as defined by Longhurst (1995; 1998; 2006). The division has been based on the prevailing role of physical forcing as a regulator of phytoplankton distribution. The dataset contains the initial static boundaries developed at the Bedford Institute of Oceanography, Canada. Note that the boundaries of these provinces are not fixed in time and space, but are dynamic and move under seasonal and interannual changes in physical forcing. At the first level of reduction, Longhurst recognised four principal biomes: the Polar biome, the Westerlies biome, the Trade winds biome, and the Coastal biome. These four biomes are recognised in every major ocean basin. At the next level of reduction, the ocean basins are divided into provinces, roughly ten for each basin. These regions provide a template for data analysis or for making parameter assignments on a global scale. Please refer to Longhurst's publications when using these shapefiles. A summary table has been prepared by Mathias Taeger and David Lazarus, Museum für Naturkunde, Berlin (2010-03-26). This table makes it easier to relate the classification of Longhurst to the the original quantitative parameters used to create it. Productivity values are from the table in Longhurst, 1995, Chlorophyll values; photic depth and mixed layer depth originate from graphs in Longhurst, 1998. The sea temperature at 0 and 50 m are from the World Ocean Atlas (2005), average values were calculated in ArcGIS. Each parameter value was set into 5 equal intervals. Download summary table. Flanders Marine Institute (2009). Longhurst Provinces. Available online at http://www.marineregions.org/. Consulted on 2019-04-18. Longhurst, A.R. (2006). 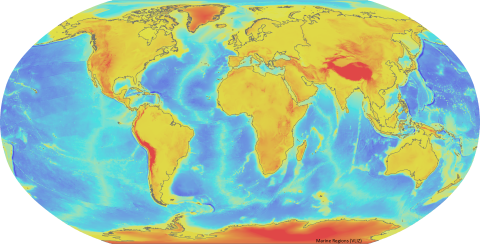 Ecological Geography of the Sea. 2nd Edition. Academic Press, San Diego, 560p. MEOW is a biogeographic classification of the world's coasts and shelves. It is the first ever comprehensive marine classification system with clearly defined boundaries and definitions and was developed to closely link to existing regional systems. The ecoregions nest within the broader biogeographic tiers of Realms and Provinces. MEOW represents broad-scale patterns of species and communities in the ocean, and was designed as a tool for planning conservation across a range of scales and assessing conservation efforts and gaps worldwide. The current system focuses on coast and shelf areas (as this is where the majority of human activity and conservation action is focused) and does not consider realms in pelagic or deep benthic environment. It is hoped that parallel but distinct systems for pelagic and deep benthic biotas will be devised in the near future. The project was led by The Nature Conservancy (TNC) and the World Wildlife Fund (WWF), with broad input from a working group representing key NGO, academic and intergovernmental conservation partners. Note: The inland boundaries of the ecoregions extend far inland - a convention to ensure inclusion of any coastline and estuarine/lagoonal systems which may be derived from different map sources. For visualisations in the Marine Regions gazetteer, the areas inland have been removed from the shapefile. Delineation of the ICES Ecoregions was originally described in ICES Advice ACFM/ACE report (2004). In the present updated version, the delineation has been updated to account for additional policy objectives and reconciling of legislation (eg the MSFD and the EU water and habitats directives). Within the EU accept the MSFD regional and sub-regional definitions. Separate Icelandic Seas from those around Greenland. Use Large Marine Ecosystem units to define the Arctic Ocean. 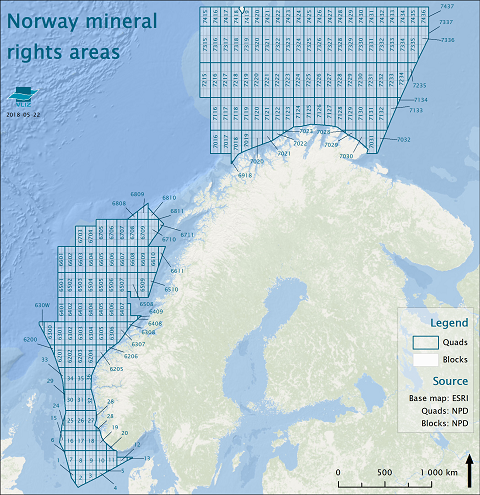 Use the accepted Norwegian regional management plans definitions of the Norwegian and Barents Seas. This set of polygons is used to sort and/or merge zooplankton species into regions of narrow or broad interest for biomass and abundance analysis. The results are reported yearly in 'State of the physical, biological and selected fishery resources of Pacific Canadian marine ecosystems'. Chandler, P.C., King, S.A., and Perry, R.I. (Eds.). 2016. State of the physical, biological and selected fishery resources of Pacific Canadian marine ecosystems in 2015. Can. Tech. Rep. Fish. Aquat. Sci. 3179: viii + 230 p.
The spatial planning framework for Canada's national network of Marine Protected Areas (MPAs) is comprised of 13 ecologically defined bioregions that cover Canada's oceans and the Great Lakes. Note that the geographic boundaries for the bioregions are fuzzy and may change based on ecosystemic conditions. DFO. 2009. 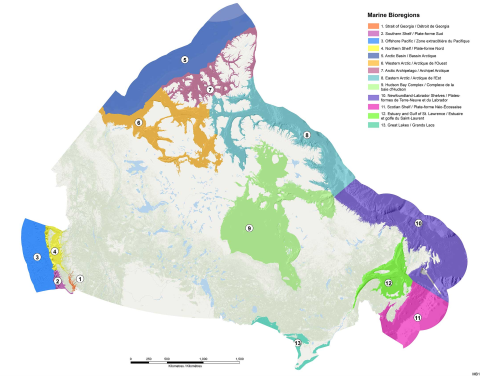 Development of a Framework and Principles for the Biogeographic Classification of Canadian Marine Areas. DFO Can. Sci. Advis. Sec. Sci. Advis. Rep. 2009/056. DFO. 2010. Proceedings of a National Science Advisory Process to Provide Guidance on the Development of a Framework and Principles for the Biogeographic Classification of Canadian Marine Areas; 15-16 June 2009. DFO Can. Sci. Advis. Sec. Proceed. Ser. 2009/039. 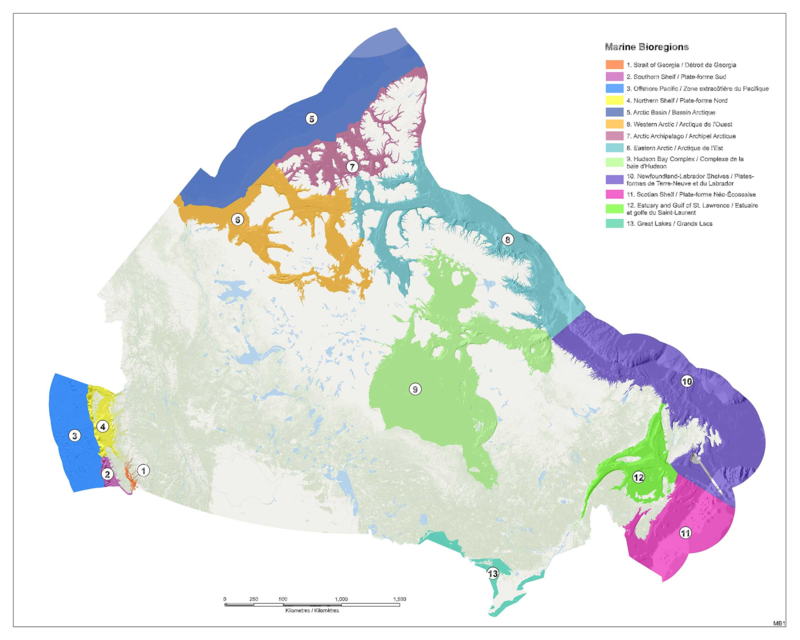 National Framework for Canada's Network of Marine Protected Areas. The ICES Statistical Areas delineates the divisions and subdivisions of FAO Major Fishing area 27. The Areas are used as bounding areas for calculation of fish statistics, e.g. catch per unit effort (CPUE) and stock estimates. The ICES statistical Rectangles are used as bounding areas for calculation of fish statistics, e.g. catch per unit effort (CPUE) and stock estimates. The NAFO Convention Area encompasses a very large portion of the Atlantic Ocean and includes the 200-mile zones of Coastal States jurisdiction (USA, Canada, St. Pierre et Miquelon and Greenland). The total area under NAFO's Convention is 6,551,289 km2. Geographic delineations of the NAFO Convention Area are described in the NAFO Convention and are included in Marine Regions. The dataset represents the boundaries of the FAO Fishing Areas. The source for the boundaries is the description that can be found on the FAO website. The dataset was composed by the Flanders Marine Data and Information Centre. The project 'A century of sea fisheries' brings together data and information from different, fragmented sources into an integrated database. The historical Belgian fishing grounds are included in Marine Regions. as follows: A, B, D, F, H, J: belongs to category 1 - E, G, I, K: belongs to category 2 - C belongs to both categroies. Original bilingual denominations were accounted for and correctly included in marineregions.org, however, for sites named in one single language, it was assumed that the language of appellation was the main official language of the corresponding country. This file contains the 46 World Marine Heritage Sites. Launched in 2005, the mission of the world Heritage Marine Programme is to establish effective conservation of existing and potential marine areas of Outstanding Universal Value to make sure they will be maintained and thrive for generations to come. In order to create the data, information from the UNESCO World Heritage Marine Programme and Protected Planet were collected and compiled. Flanders Marine Institute (2013). World Marine Heritage Sites (version 1). Available online at http://www.marineregions.org/. Consulted on 2019-04-18. To create a global overview of contourite distribution, a literature study was performed. This task fits in the IGCP- and INQUA-project (http://www.vliz.be/projects/contourites). Both projects want to facilitate research and increase knowledge about these sediments deposits. Contourites are sedimentary units which are deposited or substantially reworked by alongslope bottom currents. They refer to the lithological unit and the terminology reflects the grain size of the sediment. Drifts refer to the same sedimentary unit as a contourite, but the word 'drift' reflects the morphological appearance of the sedimentary unit. Their terminology reflects the external shape, and the internal shape, which is determined by seismography. If drifts are clustered into a local area of certain size, we call the clustered sediment group a Contourite Depositional System (CDS). These sedimentary units are generally, but not exclusively, found in the deep sea (>2000m depth). They are a useful tool for determining paleoceanic and paleoclimatic changes, since their distribution is linked to bottom currents. They have gained interest from the hydrocarbon industry, since accumulation of source rocks may be influenced by bottom currents. Slope instability is also an area of interest for further research. For acquisition of the resulting information, several hundreds of papers on the relevant subject were read. When there were maps or similar images about contourites included in the paper, shapefiles were created by georeferencing them in QGIS, which were then uploaded into the Marine Regions website. If the articles did not provide such a map or image, the drifts or CDS's were marked by a single point with its set of coordinates. 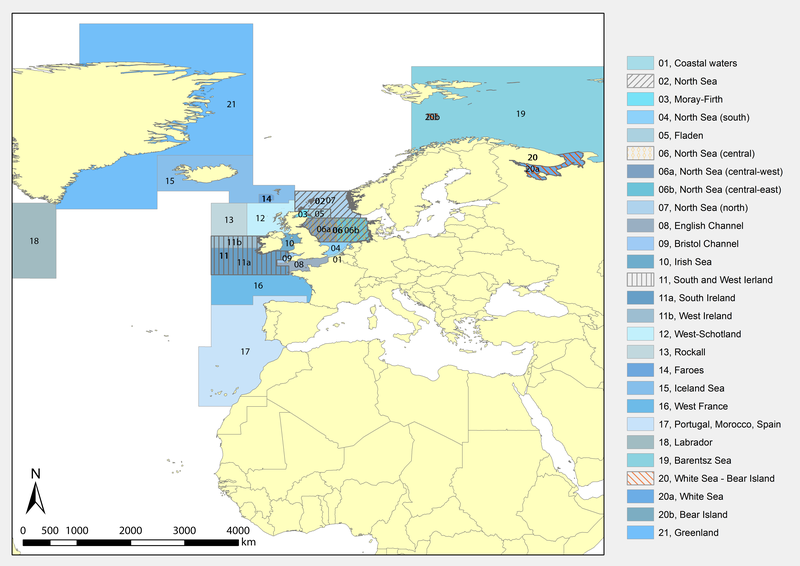 In 2013, 166 records with the place type Drift were added to the Marine Gazetteer. These are linked to one of the 24 Contourite Depositional Systems, if they make part of such a system. Each drift is also influenced by a water mass or current. This water mass or current determines the sedimentation, erosion and movements of these sediments. In 2014, the list was extended with 81 records of the place type Drift. No Contourite Depositional Systems were added. The search process was identical to 2013, only this time a summary paper was the starting point (Rebesco et al., 2014). In this publication, the major drifts were listed with their most relevant sources along with them. These listed sources were then sought after and read. In 2018, 211 new records with the place type Drift were added to the Marine Gazetteer database, as well as 5 new records with the place type Contourite Depositional System, 14 new records with the place type Water Mass and 1 new record with the place type Current. These new features were extracted from 26 recent scientific publications (2014-2018). All the Contourites and Contourite Depositional Systems were published as dataset in 2019. Different sources have been used to describe the Southern Bight of the North Sea region. The Interreg SAIL project provided geographic information on coastal regions, districts and communes bordering the Southern Bight of The North Sea. The Scheldemonitor project mapped in detail the Scheldt estuary, including the names of different mudflats and sandbanks. Also various atlases have been used to describe in detail this area. The SCAR Composite Gazetteer of Antarctica (CGA) has been compiled over a period of 20 years (commenced 1992) and consists of 36857 names that correspond to 18858 features. The SCAR gazetteer is available for download. Bulgarian place names in Antarctica are approved by the Antarctic Place-names Commission, and formally given by the President of the Republic according to the Bulgarian Constitution and the established international practice. The Commission maintains international coordination with naming authorities of other Antarctic nations, and with the Scientific Committee on Antarctic Research (SCAR). Names given by Bulgaria are incorporated in the SCAR Composite Antarctic Gazetteer. The Australian Antarctic Names and Medal Committee (AANMC) is the authority on Australian names in the Australian Antarctic Territory, and the Territory of Heard Island and the McDonald Islands. It is responsible for the investigation and acceptance or rejection of all names proposals following prescribed procedures. These proposals must meet certain criteria in order to be accepted. Included during the Ocean-Ukraine project. The New Zealand Gazetteer of Place Names contains all names for geographic places and features (both on land and undersea) within the jurisdiction of the New Zealand Geographic Board Ngā Pou Taunaha o Aotearoa (NZGB). The Board can assign, approve, alter, adopt, validate, concur with or discontinue the names of geographic and undersea features, and Crown protected areas in New Zealand, its offshore islands and continental shelf, and the Ross Dependency of Antarctica. 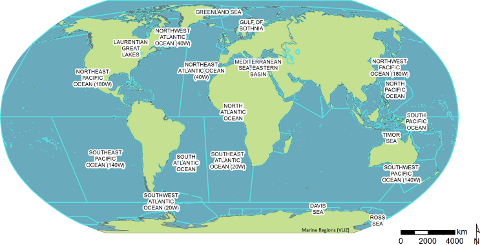 The undersea feature names shown on sheets and products of GEBCO and Regional International Bathymetric Charts (IBC) projects, and on international (INT) nautical charts are selected by the GEBCO Sub-Committee on Undersea Feature Names (SCUFN). 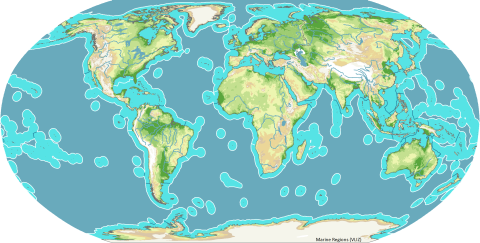 This Committee, which operates under IHO and IOC, maintains and makes available a digital gazetteer of the names and geographic position of features on the sea floor. SCUFN launched a digital gazetteer which is linked to Marine Regions, using OGC web services. The aim of a World Register of Marine Species (WoRMS) is to provide an authoritative and comprehensive list of names of marine organisms, including information on synonymy. The register contains distribution information on marine species, which is linked with Marine Regions allowing to display all species occurring is a specific biogeogrpahic region. ETOPO1 Ice Surface: Grid of Earth's surface depicting the top of the Antarctic and Greenland ice sheets. ETOPO1 Bedrock: Grid of Earth's surface depicting the bedrock underneath the ice sheets. Amante, C. and B. W. Eakins, ETOPO1 1 Arc-Minute Global Relief Model: Procedures, Data Sources and Analysis. NOAA Technical Memorandum NESDIS NGDC-24, 19 pp, March 2009. This shapefile has been prepared in the framework of COMARGE, one of the field project of the Census of Marine Life. 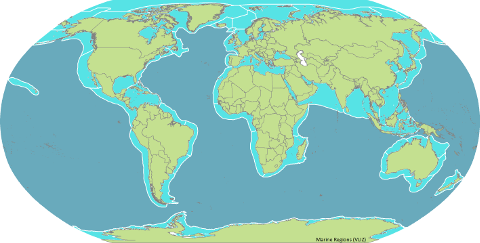 It is intended to represent continental margins worldwide, with the exclusion of the continental shelf. The continental margins have been defined based on bathymetry and expert opinion. The upper margin of the boundary has been set at 140 m depth, which is the average depth of the shelf break, except in Antarctica where the shelf break goes deeper and the upper boundary has been set up at 500 m. The lower boundary has been set at 3500 m depth. Both isobaths were extracted from S2004 Bathymetry (a global bathymetry at 1 arc-minute resolution). The upper and lower boundaries were manually edited to follow the contour of continental margins in particular cases. IFREMER (Vion, A.; Menot, L.), (2009). Continental margins between 140m and 3500m depth. Available online at http://www.marineregions.org/ Consulted on 2019-04-18. 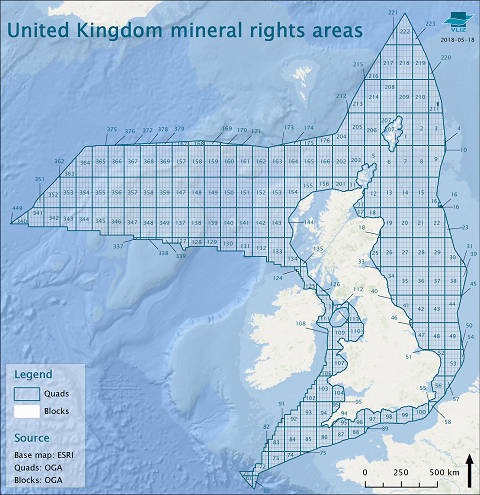 So far, the United Kingdom and Norwegian mineral rights areas have been integrated in the gazetteer. These data have been adjusted as described above. This scheme meets the need for a standard yet adaptable system of geographical units for use in recording plant distributions and arranging specimens. Because a purely political arrangement cannot meet all the needs of botanists, the scheme's arrangement compromises between a politically and a phytogeographically oriented system. It identifies geographic units worldwide in a four-level hierarchy, incorporating continents, regions, provinces and countries. Each geographical unit at each level has its own numeric or alphanumeric code. Developed originally by Olson, D. M. and E. Dinerstein (2002), Bailey (1995) and Environment Canada (Wiken, 1986), these data layers were modified by The Nature Conservancy (TNC) to be used in its Biodiversity Planning exercises in the process known as Ecoregional Assessments. Several Ecoregions were modified from the originals by TNC staff developing the aforementioned assessments. The modifications are based on ecological, bio-physical and political rationales; most changes are noted in the accompanying documentation (attributes). Ecoregions in Canada and Mexico were modified mainly at the border with US territory, where TNC modified-Bailey (1995) ecoregions crossed over the country boundaries and the Olson, D. M. and E. Dinerstein (2002) and (Wiken, 1986) were replaced where the TNC modified-Bailey (1995) overlayed them. This layer was split from the terrestrial ecoregional assessment layer in June 2008.